In 1938, Hitler was about to make his dream come true, to unite his native land, Austria, with Germany. In order to put an end to Germany’s continuous pressure towards unification, or Anschluss, Austrian Chancellor Kurt von Schuschnigg suggests a national referendum on Austria’s independence. But on March 11, Hitler demands von Schuschnigg‘s resignation and, on the following day, German troops invade Austria, which surrenders without opposing any resistance before the referendum could even take place. German regular troops had crossed the frontier at three places in a ‘symbolical occupation.’ The Independence Party, led by Chancellor Kurt Schuschnigg, smashed by Fuehrer Adolf Hitler’s ultimatum, was submerged, and many of its leaders were in flight to foreign soil. Swift developments following forty-eight hours of chaos in the little Danube republic spread fear through-out Europe. In all countries, especially in Capitals, the dread conjecture arose that Hitler’s latest coup d’état might be the curtain-raiser to a world conflict. At Praha, Capital of the Republic of Czechoslovakia, fear developed into panic. For this nation, carved by the Treaty of Versailles, is for the most part a long salient penetrating the heart of pre-war Germany. This and a variety of other factors mark it as Germany’s next victim. At midnight, with the Nazi tumult resounding along its borders, Czechoslovakia prepared for ‘eventualities.’ Officials denied mobilization, but stated that the frontier guards were being reinforced. Meanwhile refugees of Schuschnigg’s shattered ‘Fatherland Front’ Party had already streamed across, fleeing from Nazi vengeance. Trains were crowded with panic-stricken Austrians. The gravity of the event of the 11th of March cannot be exaggerated. Europe is confronted with a program of aggression, nicely calculated and timed, unfolding stage by stage, and there is only one choice open, not only to us, but to other countries who are unfortunately concerned—either to submit, like Austria, or else to take effective measures while time remains to ward off the danger and, if it cannot be warded off, to cope with it. Czechoslovakia now finds itself in danger of being isolated. Its armament industry is obviously an attractive prey for Hitler’s ambitions and its army is no match against Germany’s war machine. The Czech government firmly states its determination to preserve its autonomy. There is, however, an important German-speaking population in the country, the Sudeten, inhabiting the mountainous area of the same name near the German and Austrian borders, and where they are a majority. Troubles break out. Hitler claims that Sudeten are oppressed by the Czech-speaking majority and in May 1938 demands the incorporation of the Sudetenland into Germany. The Czech government calls the people to arms. This time war is imminent and public opinion throughout the world is alarmed. British, French, Italian and German delegates meet in Munich in September: Hitler claims that Germany has no plans for further territorial gains and that its only motive was the protection of the ethnic Germans living in Sudetenland. In order to safeguard peace, Great Britain and France force Czechoslovakia to accept Germany’s diktat and deny it military support if ever Nazi troops attack. The Munich Accord is ratified on September 29, 1938, by Neville Chamberlain, Adolph Hitler, Édouard Daladier and Benito Mussolini. There is a universal sigh of relief when the British Prime Minister announces that an agreement has been reached. Chamberlain, who is 69-year old, returns to London, exhausted but satisfied. Canadians, too, are relieved and share in the general admiration for the man who has successfully prevented another Nazi aggression. Prime Minister King tonight sent messages of appreciation and gratitude on behalf of the people of Canada to Prime Minister Chamberlain of Britain and President Roosevelt of the United Stales for their efforts in assisting in the solution of the European crisis. The heart of Canada is rejoicing tonight at the success which has crowned your unremitting efforts for peace,’ the Prime Minister said in his message to Mr. Chamberlain. ‘My colleagues in the government join with me in unbounded admiration at the service you have rendered mankind. On the very brink of chaos, with passions flaming and armies marching, the voice of reason has found a way out of the conflict which no people in their heart desired, but none seemed able to avert. — The Globe and Mail, Toronto, 30 September 1938. As euphoria recedes, that peace agreement secured at such a price is unable to dispel the anxiety created by the increasing likelihood of war. Many, including Winnipeg Free Press editor John W. Dafoe, must admit that the situation remains as uncertain as it was. I think you will find that in a period of time which may be measured by years, but may be measured only in months, Czechoslovakia will be engulfed in the Nazi regime. Perhaps they may join it in despair or in revenge. At any rate, that story is over and told. We cannot consider the abandonment and ruin of Czechoslovakia in the light only of what happened last month. It is the most grievous consequence which we have yet experienced of what we have done and of what we have left undone in the last five years – five years of futile good intention, five years of eager search for the line of least resistance, five years of uninterrupted retreat of British power, five years of neglect of our air defences. Those are the features which I stand here to declare and which marked an improvident stewardship for which Great Britain and France have dearly to pay. The Canadian government sides with Chamberlain’s conciliatory approach. King and his supporters believe that Europe needs a stable Germany as a counterweight to Stalin’s communist USSR. King has another reason for adopting such a moderate attitude: Canadian national unity. No one wants another world war and many believe that, if it were to happen, Canada would once more simply tag along behind Great Britain. During the Great War, most French-Canadians opposed conscription into the expeditionary troops sent to the front. The conscription issue resurfaces regularly, especially in Quebec, and threatens once again to divide the country: an outcome that King wants to avoid at all costs. But could Canadians still harbour doubts regarding the violence and horror that were about to be unleashed when they learned how Jews were attacked during the Kristallnacht, the Night of Crystal? In the night of 9 to 10 November 1938, groups from the Nazi Youth Organization invade Jewish neighbourhoods, breaking windows, destroying businesses and houses, setting fire to synagogues and beating up people. One hundred and one synagogues are burned down, more than 7,500 shops are vandalized, 26,000 Jews are arrested and sent to concentration camps. Ninety-one are killed. The Holocaust has started. It is becoming obvious that no one can appease Hitler and Nazi Germany any more. Making a farce of the agreement signed a few months before, Hitler launches an attack on Prague. On March 16, 1939, he proclaims that Czechoslovakia has ceased to exist. Great Britain and France are getting ready for war. Despite these dramatic political events, King George VI and Queen Elisabeth agree to leave British soil to visit Canada. 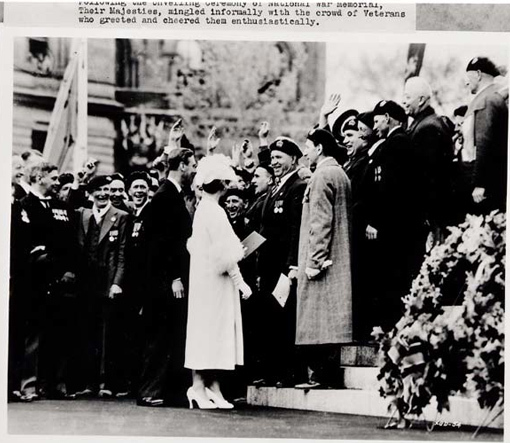 From May 17 to June 17, 1939, they tour the whole country and are everywhere greeted by enthusiastic crowds. Great Britain will need Canada’s support in the war that lurks on the horizon. When they leave Halifax, the King and Queen know they can rely on the support of the Canadian people.